Retrospect. Hindsight. Looking back. We’re often asked how we might redo history, knowing what we know now. What would I change about the summer of 2002? 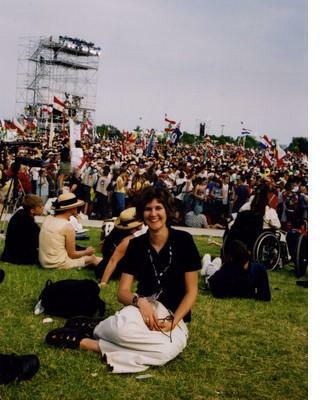 World Youth Day 2002 provided me with one my first jobs… I was working in the Program Department helping to organize the volunteers and logistics of festival stages and catechesis churches. Stepping out of school and into a job that meant welcoming hundreds of thousands of young people from around the world to the city of Toronto was absolutely, 100 percent, over-the-top overwhelming. But it was also gloriously fun and a blessed opportunity through which to learn and grow and live and laugh. Like many jobs, the hours were long, schedules difficult to coordinate, meetings abundant, and time limited. But in each of these moments, God was there. I don’t think I knew it at the time but – in hindsight, 20/02 – I now know it to be true. An example – picture Downsview on a very rainy Sunday morning, crowded with 800,000 pilgrims. My job that morning was to ensure that all the Communion stations, located throughout Downsview Park, had enough hosts for distribution. I was sent off in a golf cart loaded with hosts and a map to all the stations. But the one thing that map didn’t show? That all paths to the stations were blocked off by thousands of soaking Mass-goers. Very quickly I realized that people attending Mass being said by the Pope are reluctant (which is to say, they absolutely refuse) to move for anything or anyone, particularly a golf cart. After being thrown angry stares and words by one pilgrim too many, I stopped my golf cart in the middle of Downsview Park and nearly cried in complete frustration. Nearly. Because just a second before the sobbing began, I heard through the crowd, “Hey, Gill!” I turned and there – in a meeting that could never have been planned among a crowd so big – stood my sister. In such a low moment, God sent love. Would I change that moment? If I had known that the paths to the communion stations were blocked off by pilgrims, would I have just refused to go in the first place? If I had known that people would be so angry to have their moment with the Holy Father interrupted by a golf cart, would I have just said no to the job? If I had known what I know now, would I redo history?